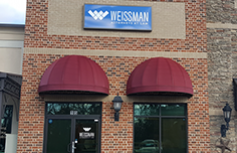 Enjoy this short video guide to help you navigate your way to Weissman's 85 North office. Take I-85 South to exit 129 toward Highway 53. At the end of the exit ramp, take a right at the stoplight onto Highway 53 West. Stay straight through the next 2 stoplights. Just after the 2nd stoplight, the road will transition from 2 lanes to 1 lane; drive approximately .25 mile ahead and Weissman will be on the right. After the large brick building with the white columns, turn right into the Hometown Walk shopping center. Weissman is in the middle of the center. If you accidently miss the first entrance to the shopping complex, take your next right onto New Cut Road. Then take the 1st right into the back entrance of the Hometown Walk shopping center. Drive around to the front and Weissman will be on the left. Take I-85 North to exit 129 toward Highway 53. At the end of the exit ramp, take a left at the stoplight onto Highway 53 West. Stay straight through the next 3 stoplights. Just after the 3rd stoplight, the road will transition from 2 lanes to 1 lane; drive approximately .25 mile ahead and Weissman will be on the right. Just after the large brick building with the white columns, turn right into the Hometown Walk shopping center. Weissman is in the middle of the center. PLEASE NOTE THAT WAZE DOES NOT WORK FOR THIS DESTINATION. Welcome to Weissman’s 85 North office. Click below to enjoy an interactive virtual tour of the office.